Today I'm partnering with my buddies from Bob's Red Mill to bring you this lovely wild rice quinoa salad that just screams Spring. There are so many delicious things happening on our plates today, friends. For starters, it's a salad. And it's green. It's been ages since I shared a quinoa salad that was served cold; in fact, raw veggies in general haven't been getting the love around here. But now that we're making our way towards Spring (flowers are starting to pop up here in NYC! ), it's natural for our bodies to start craving cool meals, crisp raw veggies and leafy greens. 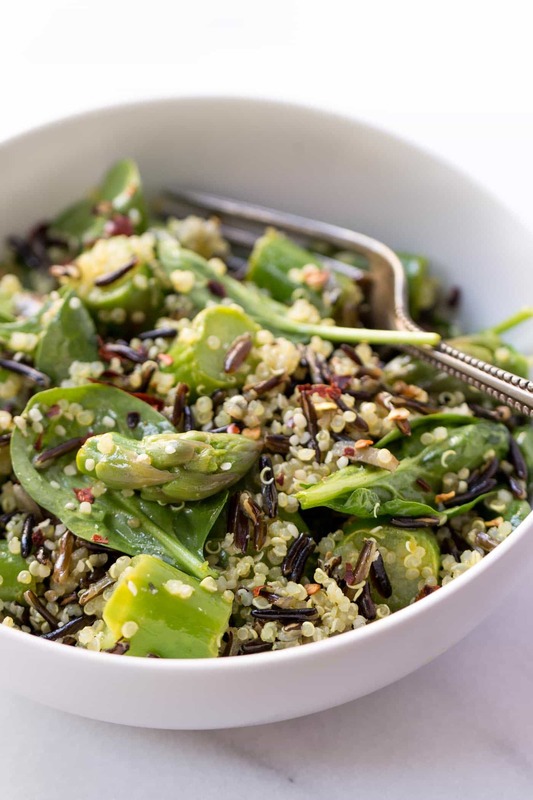 Today is more of a crossover in the sense that the base of the salad is spinach, but we're bulking it up with whole grains and steamed asparagus. 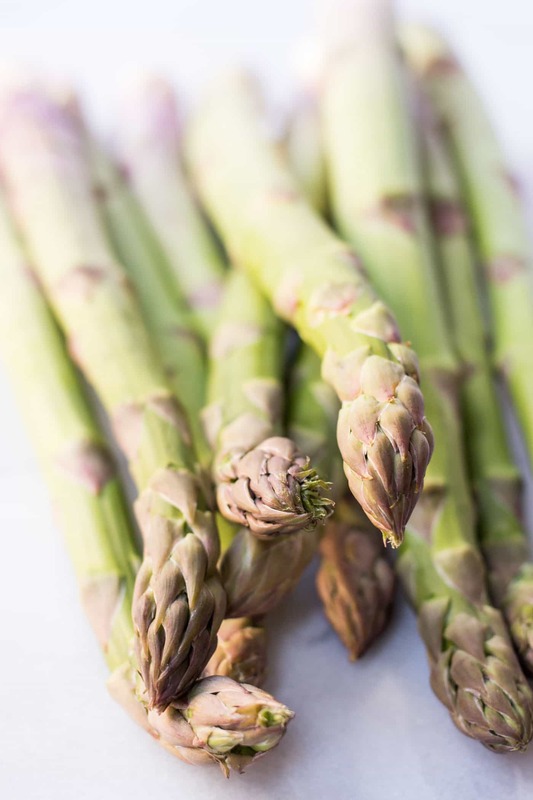 Which brings me to the second lovely thing about our plate today…asparagus. These beautiful green stalks have started popping up in the grocery store, which means (officially) that Spring is almost here. Can't even tell you how excited I am! 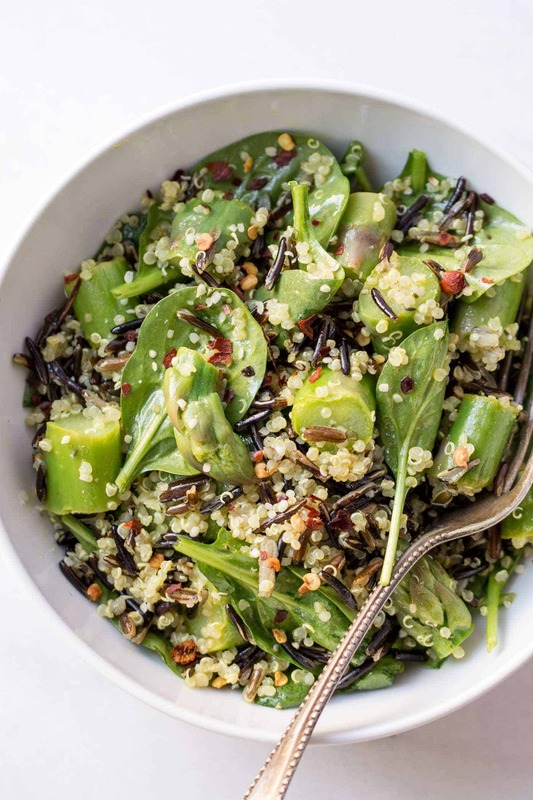 The fourth thing that I'm really loving about this salad is the combo of quinoa and wild rice. 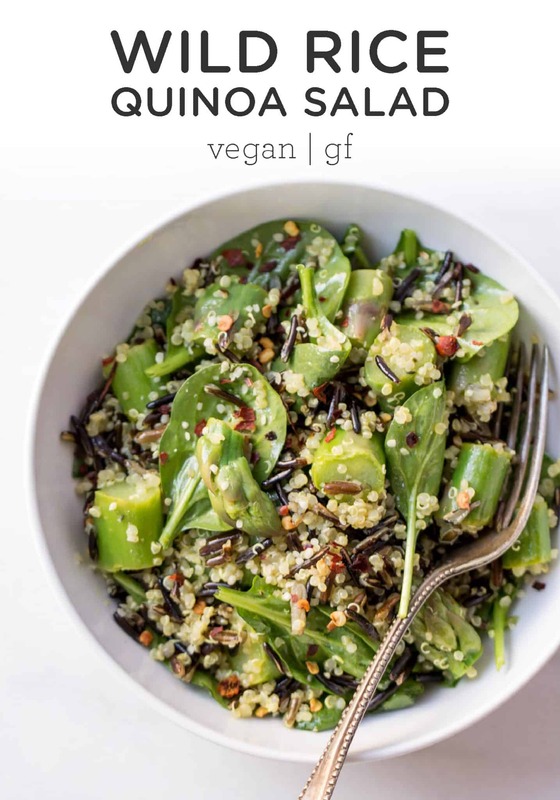 When you have an entire website dedicated to quinoa, other grains tend to get left behind, so this month I'm making an effort to start incorporating other gluten-free whole grains into my meals. I've always loved wild rice, but I think this is the first time I've actually ever made it. 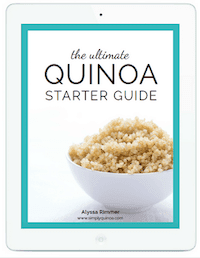 It cooks just like quinoa or other grains, but the cooking time is definitely more comparable to brown rice than to quinoa. 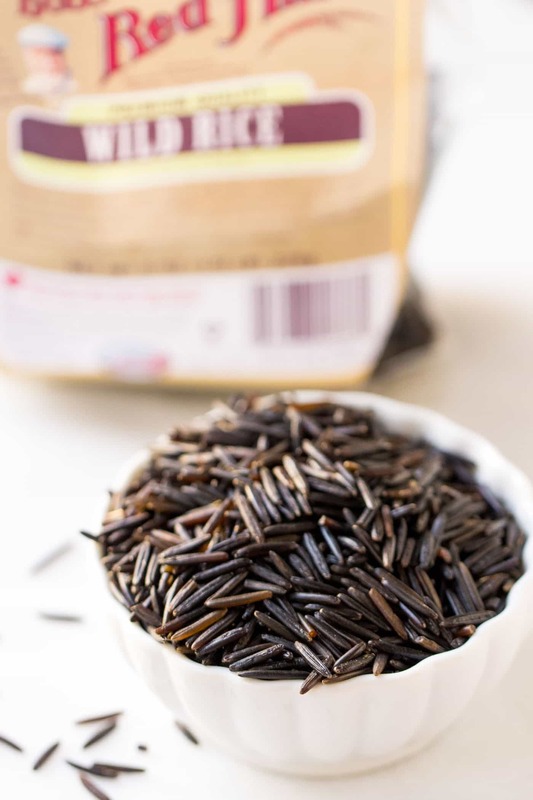 So if you're in a rush, either make your wild rice ahead of time (it will keep in the fridge for a few days) OR save this salad for another time. You might be wondering, could you leave it out? I mean sure, you could leave it out, but this salad is in desperate need of the crunch that the wild rice brings. It also makes the salad a bit more flavorful and way more fun to look at. Isn't it pretty!? The final thing I want to mention about this salad is the dressing. 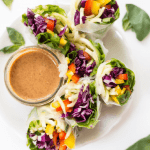 You know that I don't usually go for oil-based dressings – I'm all about the creamy, tahini-based ones – but this one might just be the recipe that sways me. 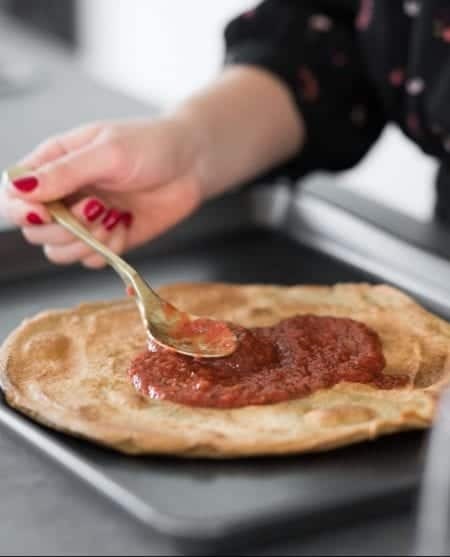 It's actually super simple, but I think it's the combination of ingredients that turns it into something magical. The base is simply olive oil, lemon and apple cider vinegar. But then I added in some raw honey, a bit of dijon mustard, a sprinkle of himalayan sea salt and then…turmeric. Yeah, I know. SO GOOD. Also so good for you! Anti-inflammatory, detoxifying and anti-microbial. And it pairs perfectly with the rest of the ingredients in our salad. 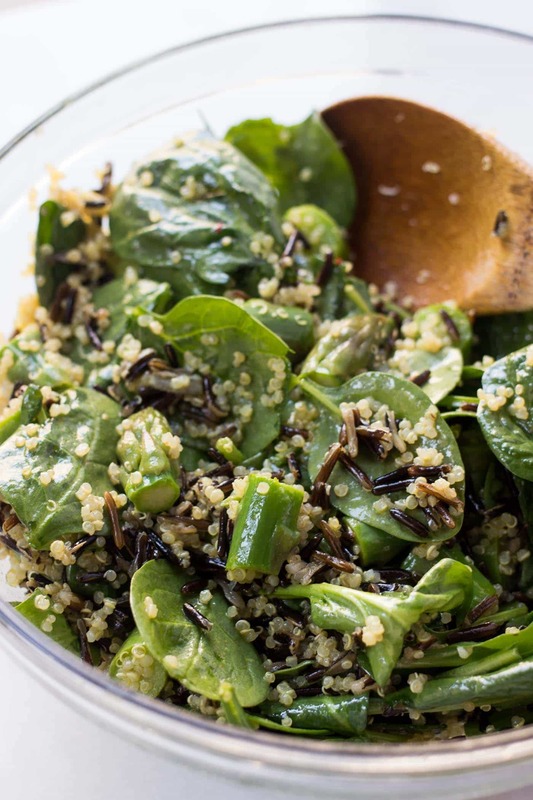 So there we have it: a simple green salad that's filled with flavor and whole grain goodness. Pretty much everything that a salad should be, don't you think? Let's talk asparagus. Do you love it? Hate it? What's your favorite way to cook it? I'm partial or roasted or grilled but I wanted this salad to have some crunch, but next time we'll go the charred and smoky route. Deal? Bring about 3 cups of water to boil, add asparagus and cook for about 2 minutes, until they're starting to get tender. Pour through a strainer and rinse with cold water to stop the cooking process. 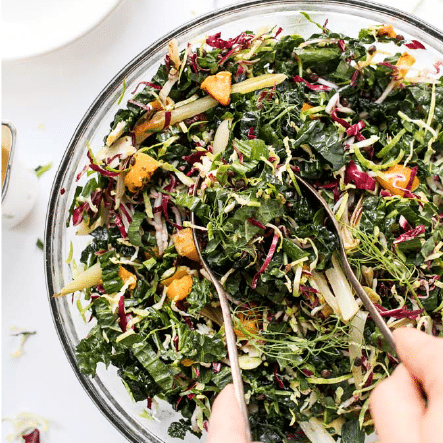 Set aside while you assemble the salad. 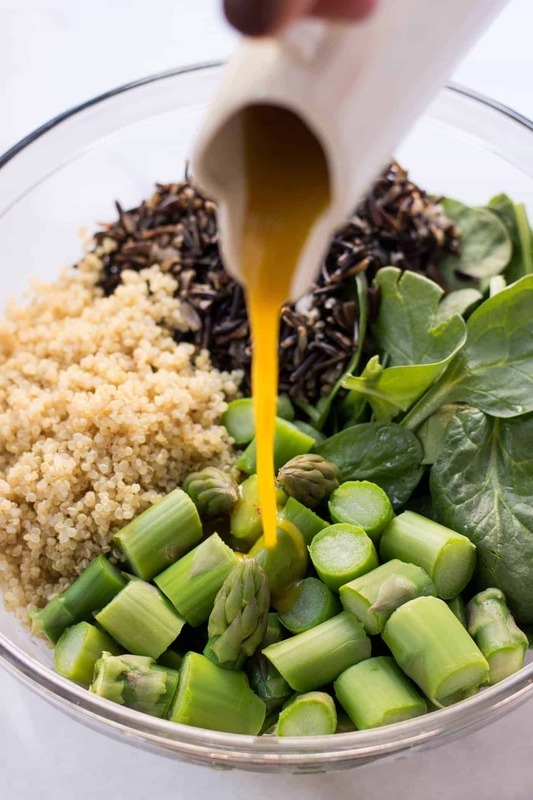 Add spinach, wild rice, quinoa and asparagus into a large bowl. Whisk together the dressing ingredients then pour over salad and toss to combine. Serve immediately or store in the fridge for up to one day. *if cooking rice from scratch, follow the instructions on the package for cooking wild rice (mine took about 50 minutes). I loved this. It was just as good the second day. I didn’t have turmeric so I used the safari-suggested substitution of chilli powder instead. I love the dressing and next time I’ll try the turmeric because there will be a next time. Also I learned how to cook asparagus. I had been cooking it waaay too long. Hi Alyssa! Wanted to thank you for this salad ~ it is simply incredible! It’s been my dinner now for the last two days and I’ll probably have it again tonight! I just warm up the three cooked ingredients in a frying pan with a bit of water and then add them to the raw greens. Such a great combination and taste. 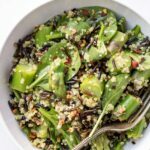 I needed to change up a couple things only because I didn’t have any spinach or wild rice at the time, so replaced the spinach with ribboned swiss chard (massaged with a bit of salt to tenderize) and replaced the wild rice with black japonica rice. I also forgot to add the sweetener (honey or maple syrup) to the dressing, but it still turned out great. 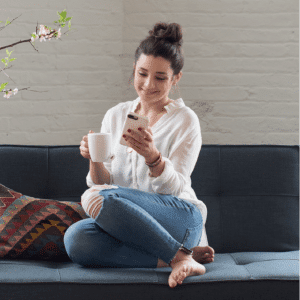 Really appreciate the quinoa bowls you’ve been presenting. They are such a nourishing meal! That asparagus is just so beautiful!! Almost to beautiful to eat (notice how I said almost, haha!). I love cold veggie salads to pack for lunch. This would be perfect!